Perfect weather for this interesting volcano climb in the Three Sisters Wilderness in central Oregon. The Pole Creek trail is dusty, but in very good condition. One stream crossing about two miles in is easy to negotiate on logs and a good place to replenish water. Road conditions: Paved for a couple of miles out of Sisters. Good gravel road with some wash-boarding for about 10 miles to the Pole Creek trailhead. The Pole Creek trail is dusty, but in very good condition. One stream crossing about two miles in is easy to negotiate on logs and a good place to replenish water. Took a boot-track shortcut after another two miles to nice camping in low trees not far from the Hayden Glacier, plenty of running water. "A path over moraines to the glacier is fairly easy to follow up, but finding your campsite location in the trees coming back can be difficult. Tie orange or yellow tape on tree branches, and/or use GPS. Roped up for glacier travel along the hogback; no crevasses along this route, but many were open on either side. 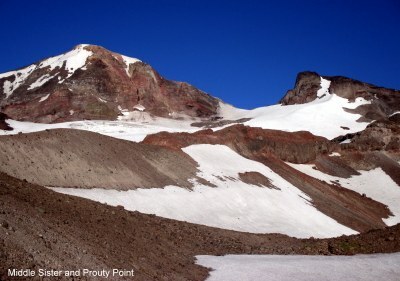 A bergschrund was becoming visible just below the saddle on the right between Prouty Point and Middle Sister. Much rockfall from Prouty Point and northeast face of Middle Sister. Helmets needed! Getting up onto the saddle to access Middle Sister’s north ridge presented a 20 foot challenge on extremely loose, unstable small and large rocks. The north ridge boot path starts out obvious, but a variety of other “paths” quickly become apparent. We followed a set of prints that veered a little too far west, and had to traverse an extremely steep, loose, scree slope to reach relatively stable ground. Following paths of least resistance on a very steep scree slope, we reached the summit safely. Everyone handled the conditions with confidence and good humor. Little wind, comfortable temps, and a clear blue sky rewarded us with incredible views all the way north to Mt. Adams and south to what appeared to be the top of Mt. Shasta. After at least a half hour on the summit, we descended the north ridge direct. It does involve some sketchy rock scrambling with a little exposure, but was easier than our ascent route and would have been the best and easiest way up. Travel time to and from the peak itself was about 10 hours round trip. The second night at camp was very windy, but we all got much needed rest before hiking out the roughly six miles back to our cars. This was a long, but excellent experience in central Oregon’s land of volcanos. Well worth the time and effort."